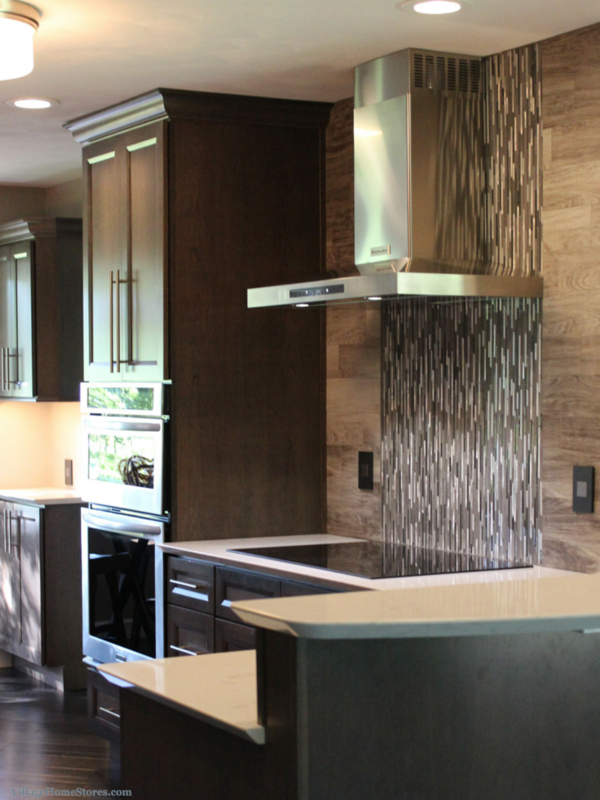 This Geneseo kitchen remodel has become one of our most talked about projects of the year. 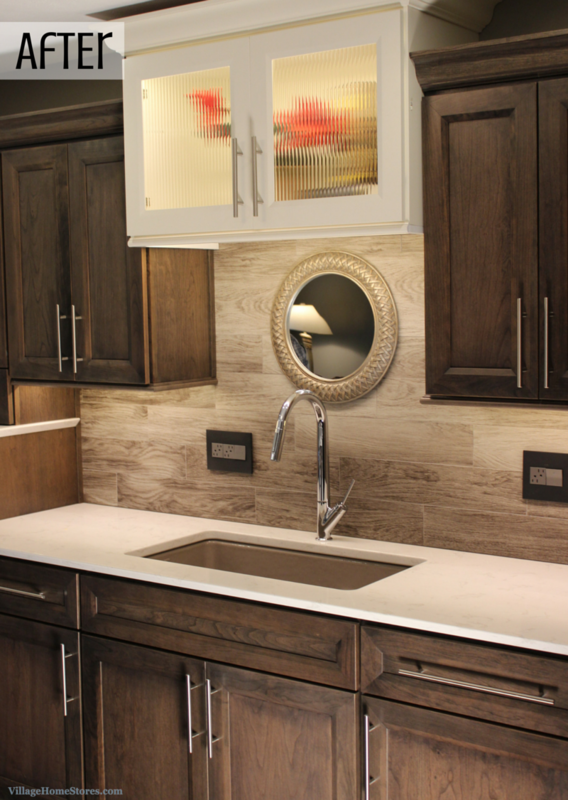 A unique stain on a rich woodgrain paired with Cambria quartz counters. 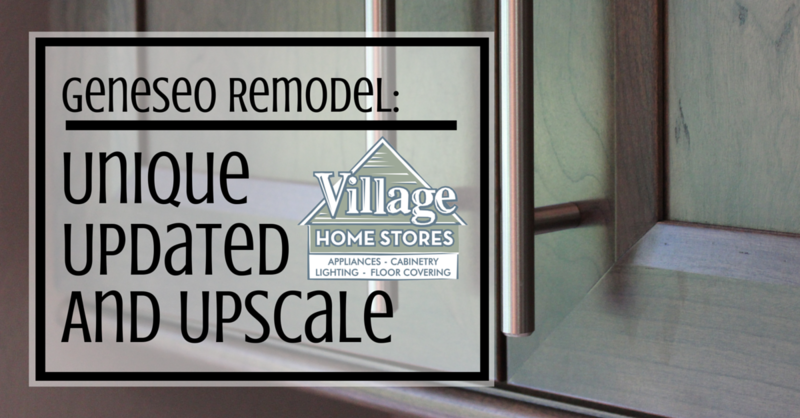 Watch a full episode of the Village Home Show dedicated entirely to this Before & After story. Click the video below to see the full tour (commercial free). Cherry cabinetry from our Dura Supreme line in their “Caraway” stain is at center stage in this new kitchen. The “Lynden” doorstyle is a Transitional choice, yet when paired with the other finishes and furnishings this kitchen it almost borders along a Modern style. To get the full picture of just how much of a transformation in style this space has seen take a look at this before photo. We don’t want to discredit the original kitchen at all. The layout and design details were way ahead of their game when this kitchen was last remodeled (22 years ago). Medium Oak raised-panel cabinetry and a beveled edge Formica top including a full-height backsplash matching the countertops. Warm grays and unique design details have not only brought this kitchen up to date, it is now ahead of the current trends. If you haven’t noticed lately when shopping for any type of item for your home or even clothing and accessories, gray has become a powerhouse neutral. We wrote here on the blog just this past Spring that Gray is Here to Stay. Where did we officially hear this news? From the team at Dura Supreme Cabinetry who forecast gray to stay on track long-term. Projected to be popular for the next 5-8 years, that was reason enough for Dura to launch a whole line of options in the gray category for us to offer our customers. Cambria Quartz counters in the “Torquay” design are the perfect choice for a subtle veining that compliments the cabinet finish. A blend of many types of textures and materials are at work to give this kitchen a soothing look and feel. 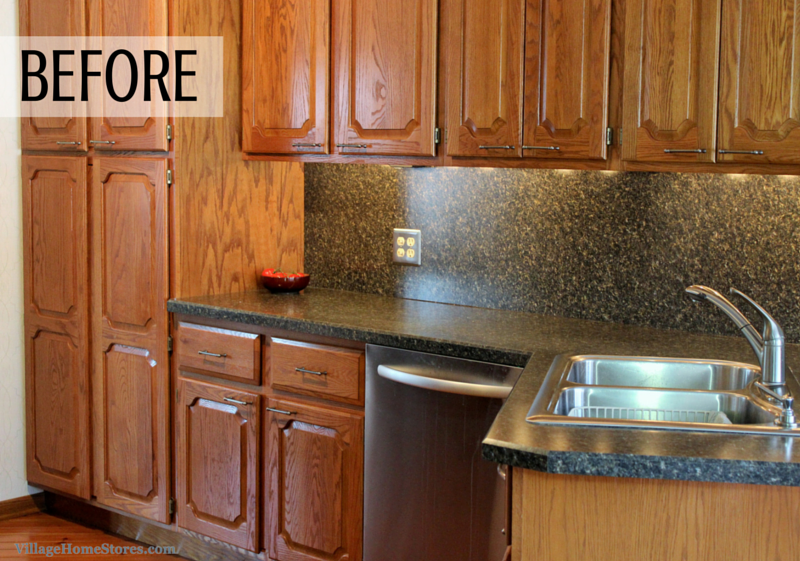 This kitchen was full remodeled from start to finish by a team from Village Home Stores. The original kitchen was contained by walls on all four sides. The Dining Room was divided up from the kitchen by this wall. Not only did this wall create two separated areas, it blocked a good deal of the natural light that the Dining Room offered. With more and more of our customers looking for a more open concept to their homes, walls often come out in remodels. In this case we removed the wall dividing the kitchen from the dining room completely and opened up the original range wall as well. You came here to see the stunning new space right? (We will get right back to that soon) first we wanted to point you to the full album of progress photos over on our Facebook page here if you are interested in how the entire project took shape. This birdseye view above shows the new kitchen design fills the two main walls with cabinetry and extends the base cabinets in from the cooktop wall as a peninsula. A kneewall supports a bar-height top in the peninsula and a shallow buffet area is installed on the opposite end creating a casual eat-in dining area along the front entry to the kitchen. The kitchen sink is now located on this main wall of cabinetry. With no window above the kitchen sink, a painted cabinet with reeded glass doors creates interest and brightens up the space. Our Diode L.E.D. 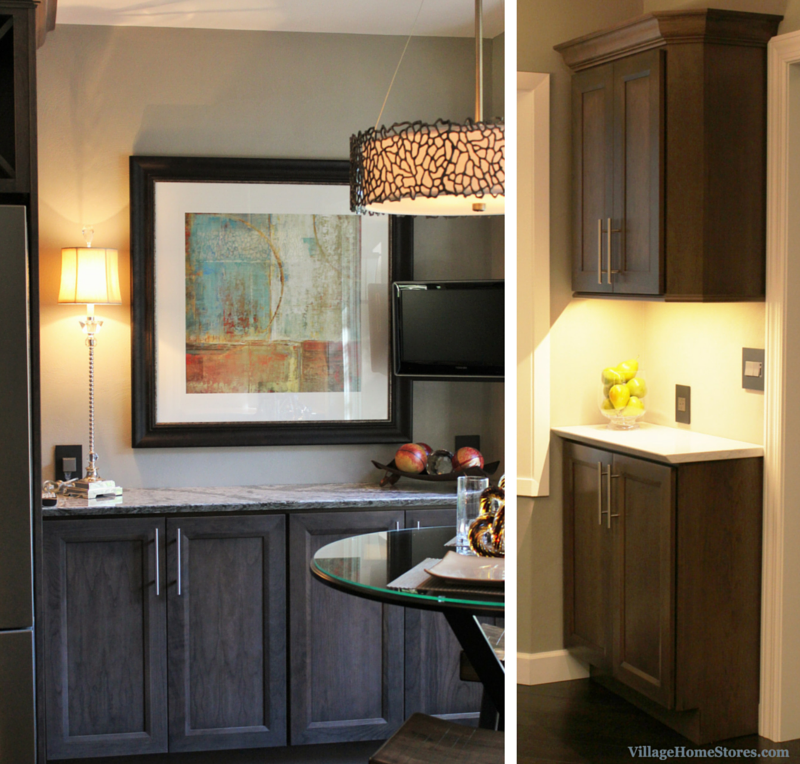 undercabinet lighting washes the countertops and also lights the interior of this painted cabinet. An undermounted sink including a low-divider configuration has been installed. 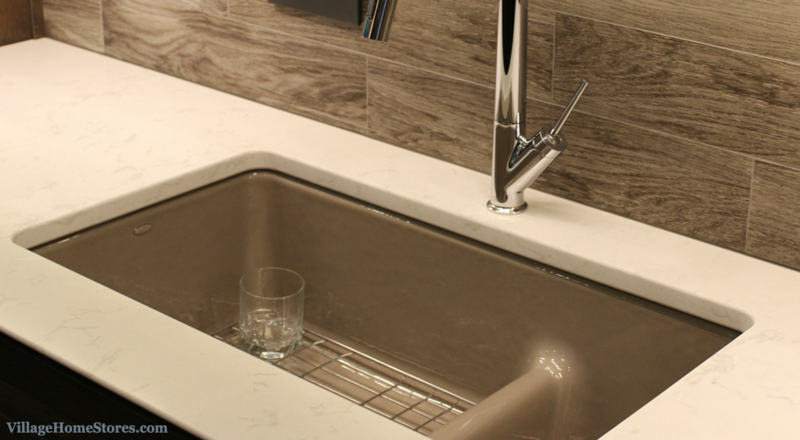 This cast-iron option allows for the perfect shade of warm gray to be used in place of an expected Stainless Steel sink. There are so many textures at work here in the new design. Many of them all in the same value of gray. By using the same grays but in varied textures it creates a sophisticated “Tone on Tone” end result. 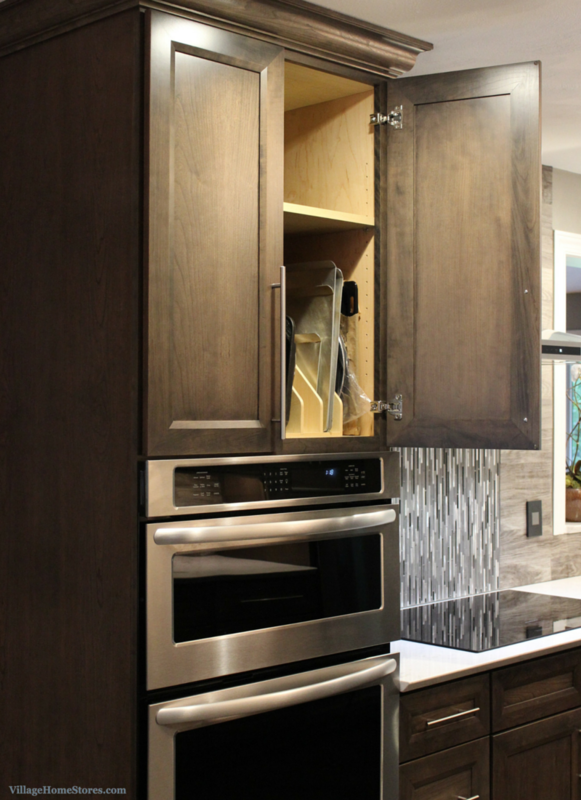 With plenty of storage throughout the new kitchen design, a cabinet above the new refrigerator wasn’t needed. 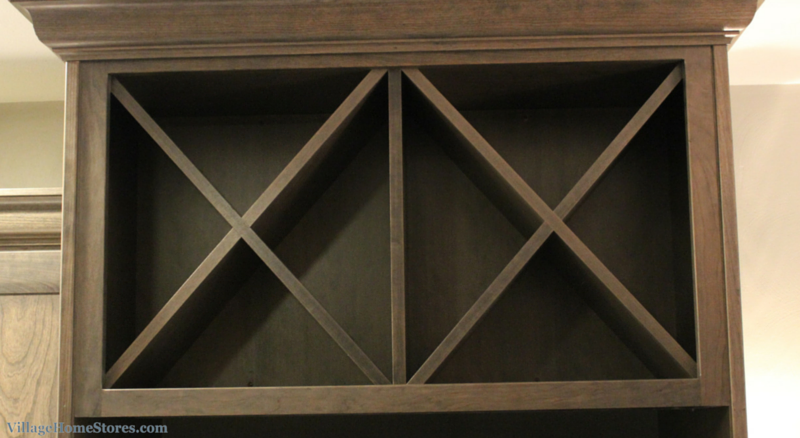 Instead a pair of X-shaped wine cabinets has been installed. 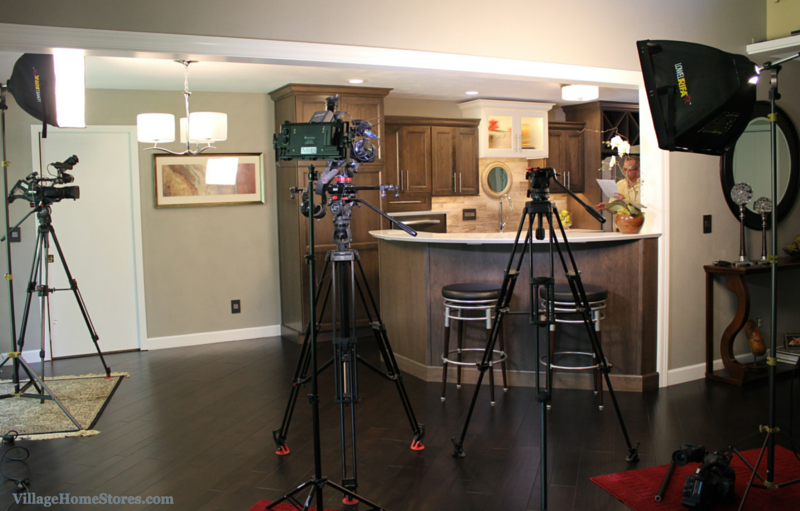 When we photographed the kitchen they had just began to “move” back into the space. Looks to us like a housewarming party needs to happen to fill this wine rack. We hope we get the invite. A raised dishwasher can be a very interesting design choice in appearance but consider the reason it might be right for you. The main benefit for raising your dishwasher up to this height is that loading and unloading the unit is far more easier when you don’t even have to bend over to do so. 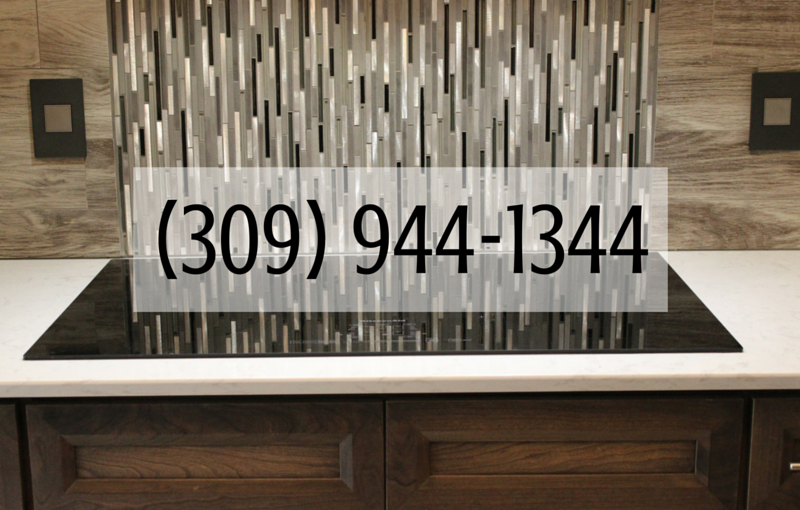 Many of the Full Project Management kitchen remodels we do are for families who love their home but want to rework the existing spaces to allow them to age there and stay longer. The most stunning area of the new kitchen is the new cooktop and hood wall. 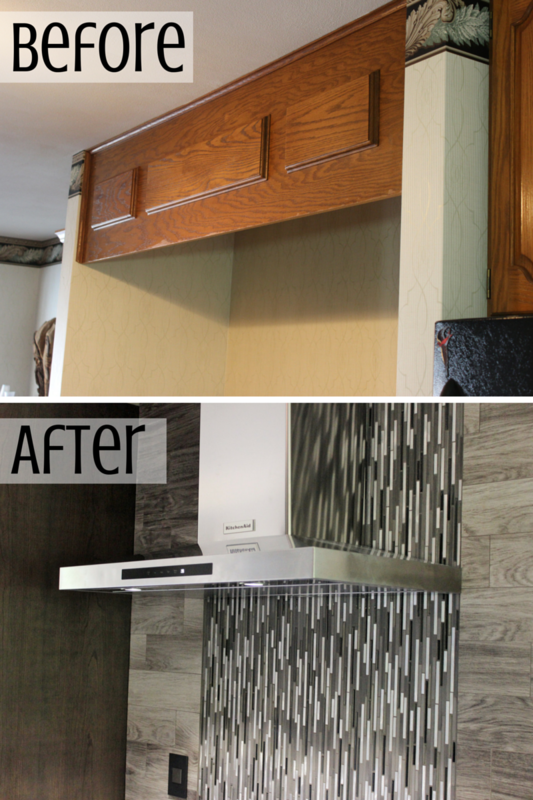 This wall has gone from a single valance in the original kitchen to a magazine-worthy look in the new kitchen! 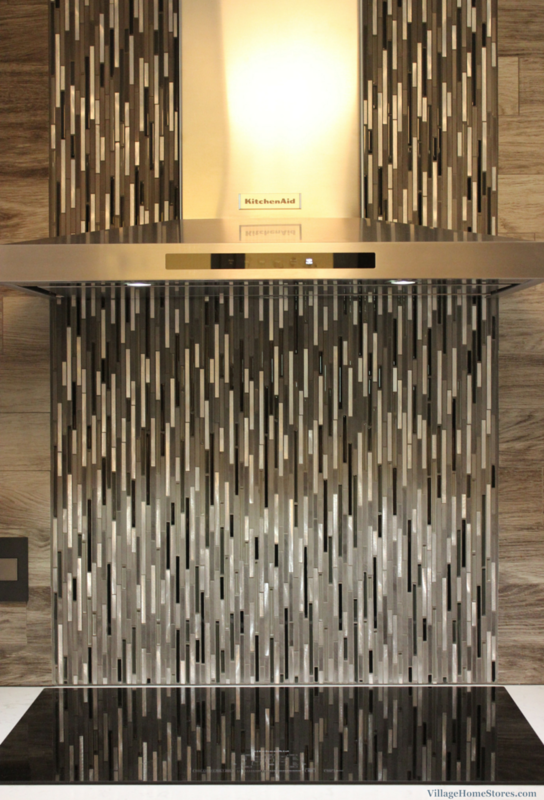 A section of cascading mosaic tile from our Glazzio line in their “Orbit” series is a blend of tile, glass, and stainless. Installed behind the KitchenAid chimney hood all the way down to the countertop. Cascading down and creating a reflection on the smooth electric cooktop, it almost looks like it flows into the countertop. The main backsplash field tile throughout the new kitchen is a porcelain tile you may recognize from this kitchen over on Houzz. The Paramount porcelain tile in the Sandal Wood “Ocean Breeze” design is great as a flooring option but we prove here once again that it makes a great wall tile. 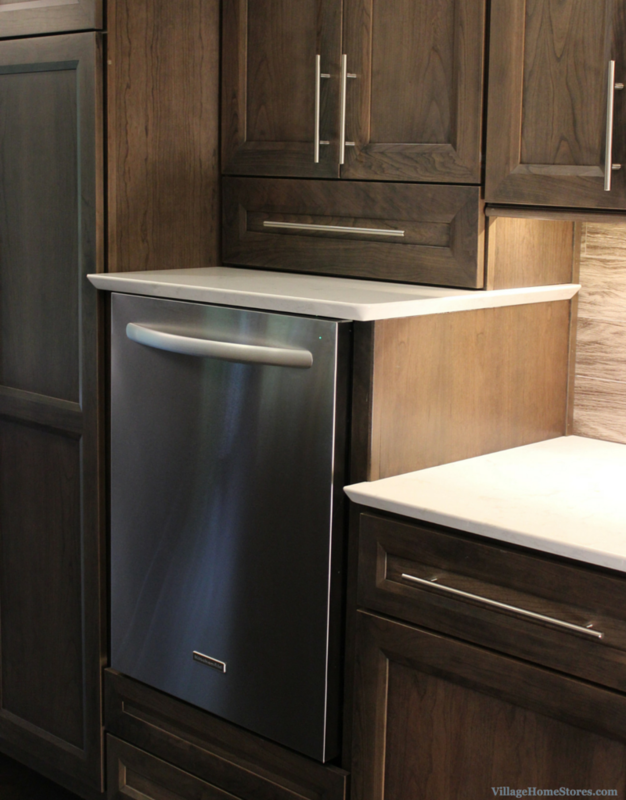 A faux wood grain look compliments the Cherry wood grain of the Dura Supreme cabinets. The Adorne collection from Legrand has been installed throughout. Pop-out outlets shown here are just some of the incredible options in this line. 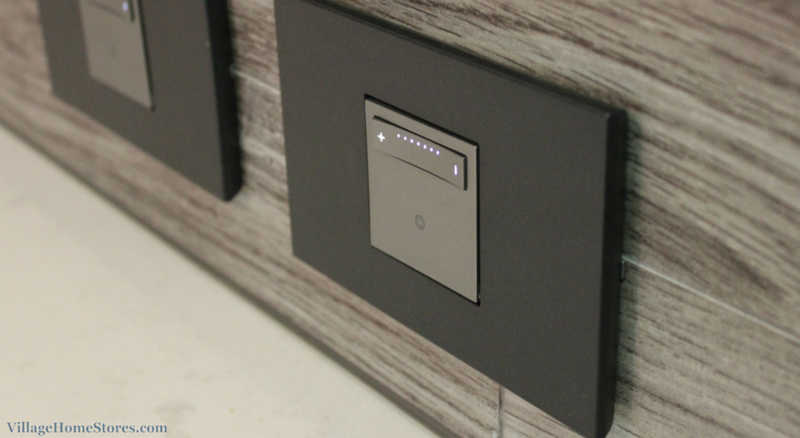 Softap touch dimmer switches has also been installed for the lighting plan in this new design. 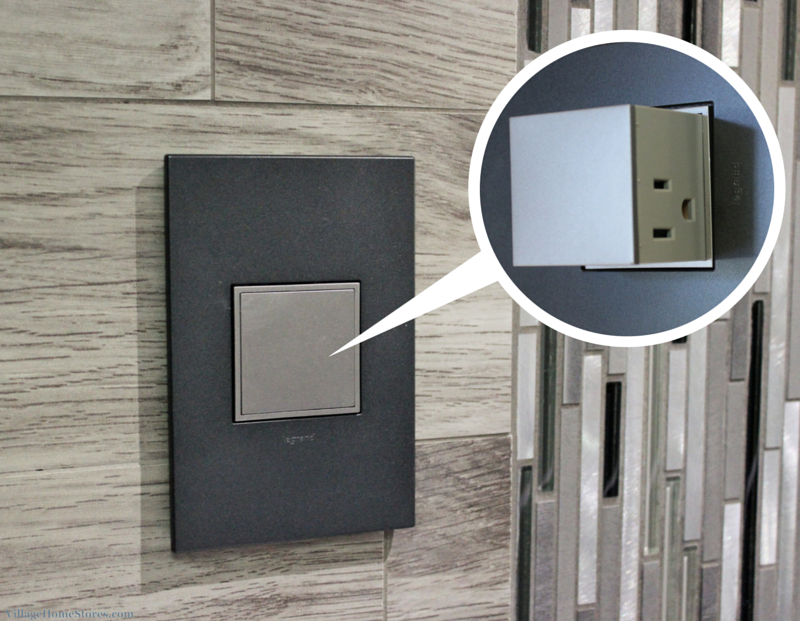 These dimmers can be set to the light level you desire and then with a single tap brought back to that level. Learn more about the Adorne collection and see a full Master Bathroom fitted with them in this recent episode of the Village Home Show. Two of those dimmers control the dining lighting selected for this new space. Located in a beautifully serene wooded lot just outside of Geneseo, the view looking out from this new kitchen are also amazing. 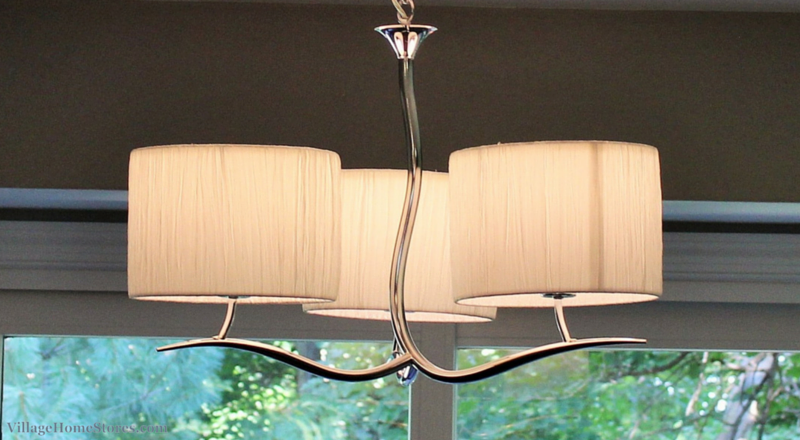 This Artcraft light fixture plays perfectly with the branches outside of the Dining Room. 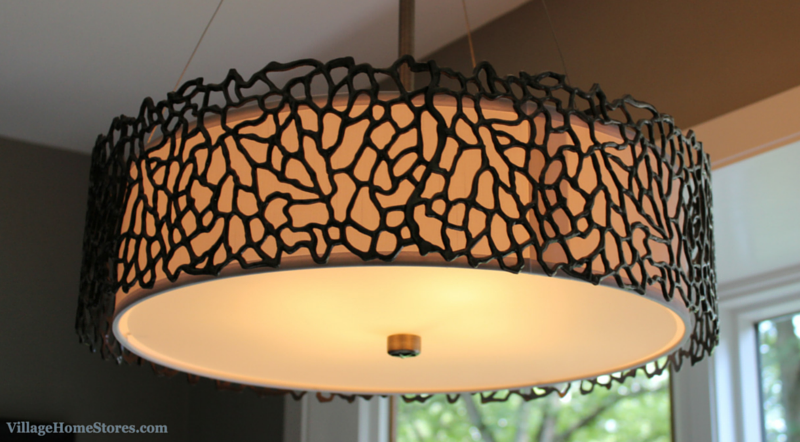 In keeping with a more organic style and lines, this drum shade fixture hangs above the casual dining area on the opposite end of the new kitchen. A Stainless Steel suite of appliances from KitchenAid was also installed throughout. KitchenAid offers a great look plus incredible features on every model. In place of a double wall oven we included a combination wall oven and microwave. 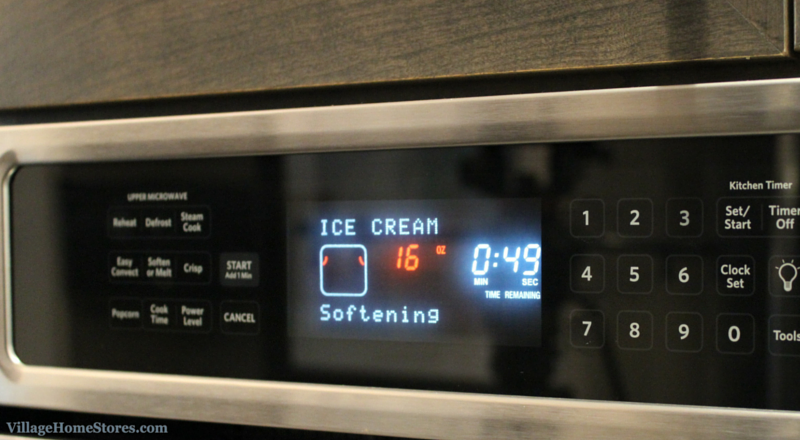 This model includes convection features so the option to have two functioning wall ovens is there when needed. Above the combination wall oven is a wood tray divider for storing bakeware. This 24″ deep oven cabinet also is the perfect location for small appliances that may otherwise clutter up your counters. Don’t let that incredible tile distract you from what was right below it. 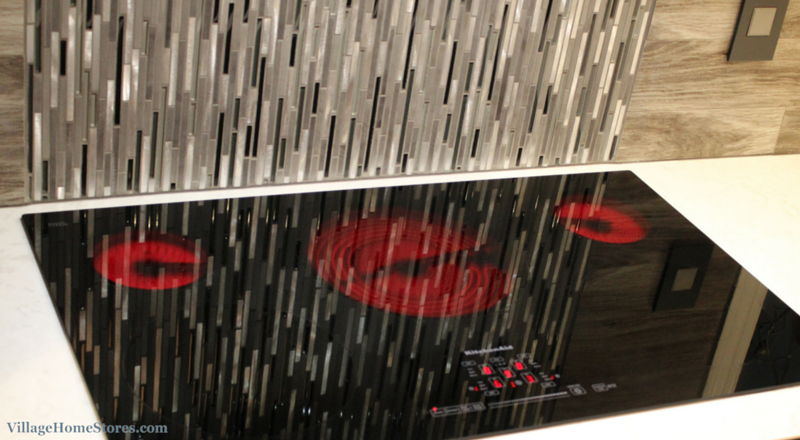 This 36″ wide electric cooktop with touch-activated controls is easy to use and looks great. 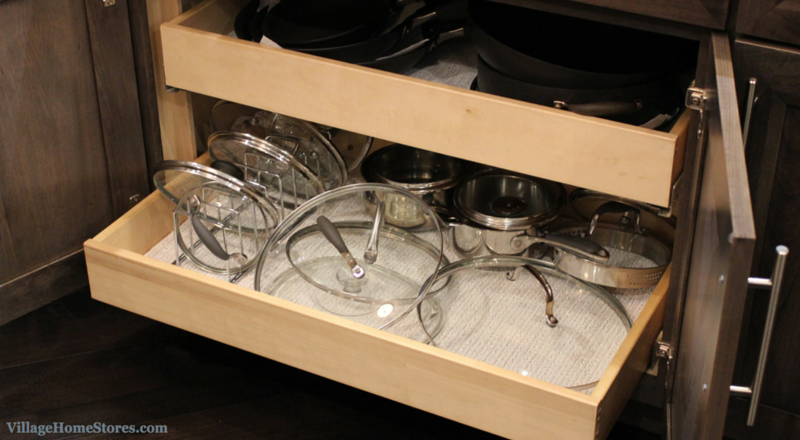 Below the cooktop is a large cabinet fit with sliding shelves that are perfect for storing pots and pans. Remember that all of our sliding shelves are adjustable and you can always install them at the best spots for whatever height your items and lids are. There are two other areas of cabinetry that are included in the new kitchen. A shallow sideboard/buffet area to the right of the refrigerator and a drop zone section of cabinetry near the front entry. There was a drop zone in the original kitchen but this configuration and location helps to keep clutter hidden and offer another space for serving or displaying items when entertaining. 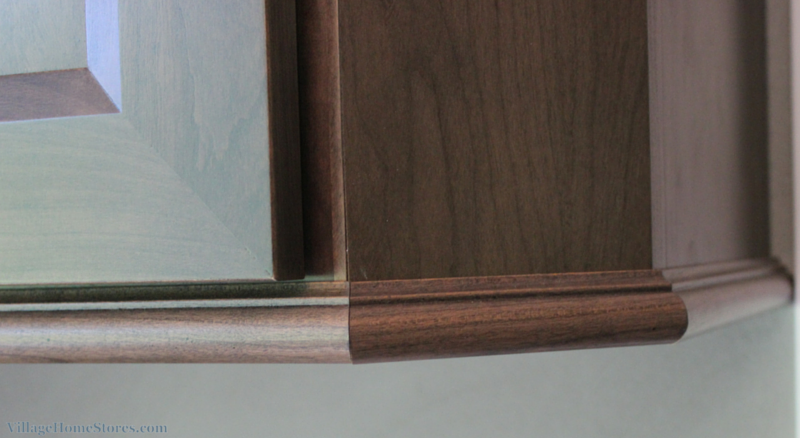 To give this section of cabinetry a unique look, beveled ends have been added. These clipped corners allow the light to hit the “Caraway” finish and also gives a chance fro the crown and undercabinet molding to wrap and make a more custom look. 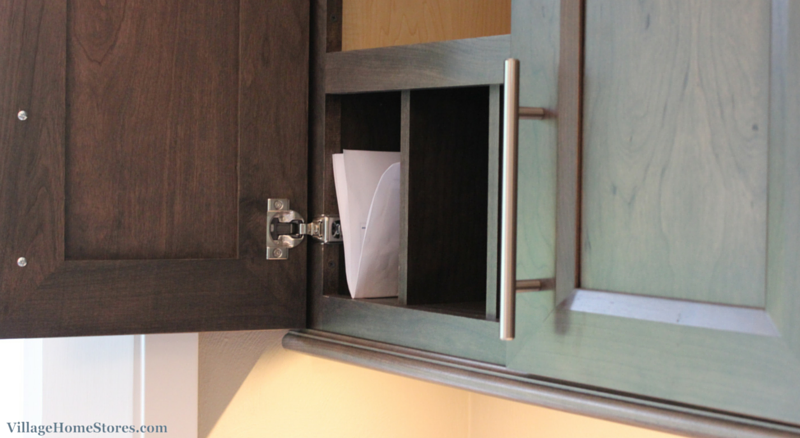 Concealed within the upper cabinet is a mail organizer. Clutter that may normally end up on the countertop can be stashed away out of sight. 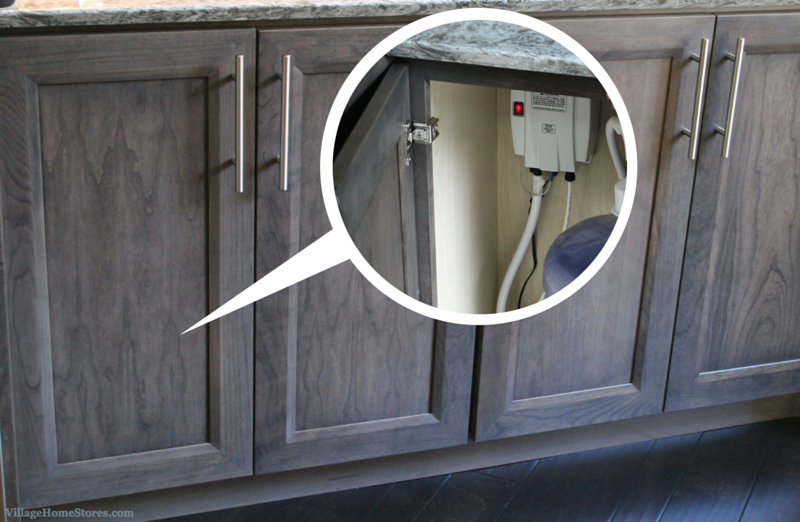 In many kitchens we include outlets in these slots to create charging stations for devices. The other area directly across from the drop zone is that sideboard/buffet section of cabinetry. Not only does this offer a great long countertop to serve from it also allows for some added storage. With Dura Supreme cabinetry there is no added cost or limitations to cut back the depth of a cabinet. In this case we were able to make the section of cabinetry perfectly sized to use up the shallow space of wall leading up to the front window of the home. Hidden inside one of these cabinets is a FloJet water pump. Hard water can be…well..hard on components of your home appliances. This system allows the homeowners to pump water from a large bottle into their new KitchenAid 29 cu. ft. refrigerator. You may also notice that this area has an accent counter. The “Galloway” design from Cambria is installed here for a bit of interest and a lot of sparkle. 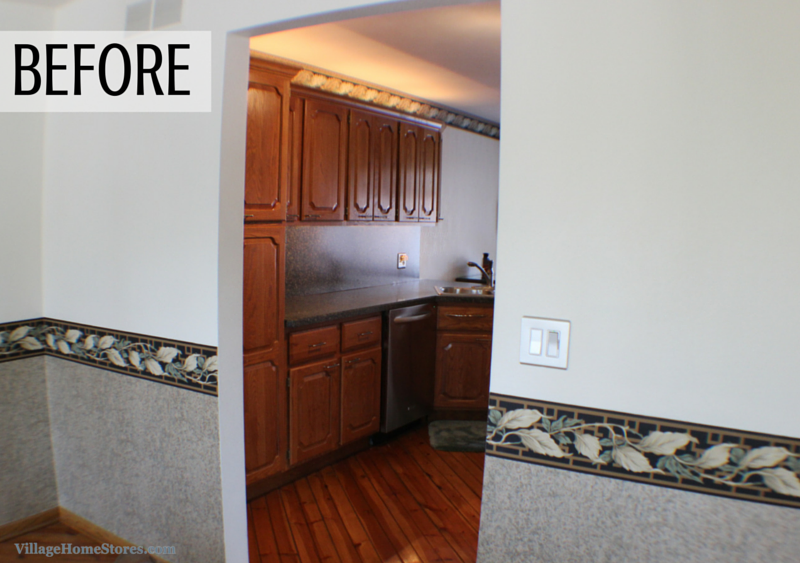 Completely remodeled from start to finish and from the floor to ceiling. Of course we have to mention the flooring. 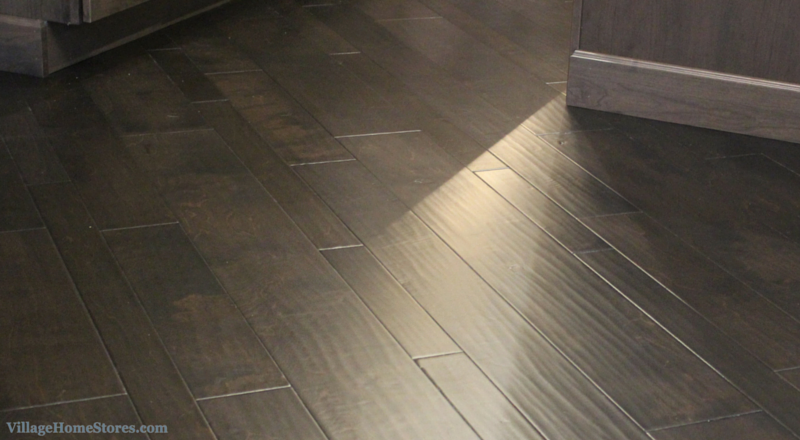 Paramount’s Monterrey Birch hardwood in the “Espresso” finish. Random widths and lengths help create a unique pattern when installed in a standard way. Installing these varied widths and lengths of hardwood at an angle sets the entire new great room off and helps this entire space have a unique, updated, and upscale look. 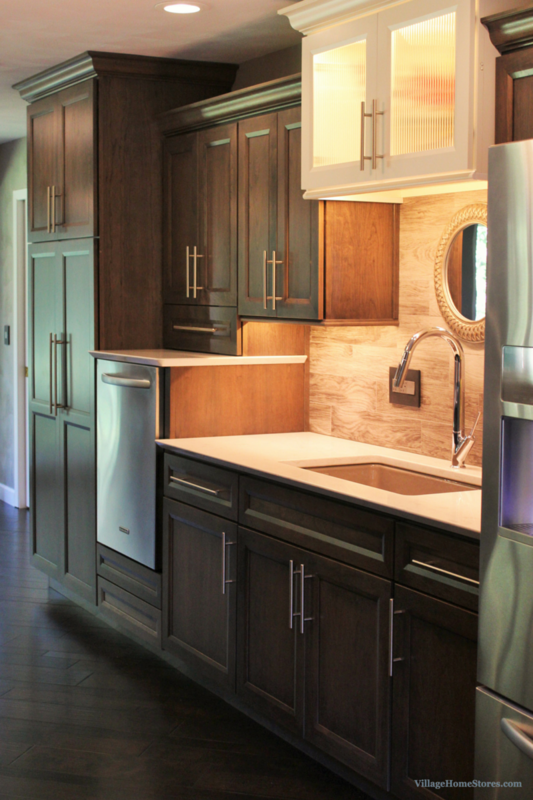 With a completed look this amazing, you know we had to include this kitchen in an episode of the Village Home Show! 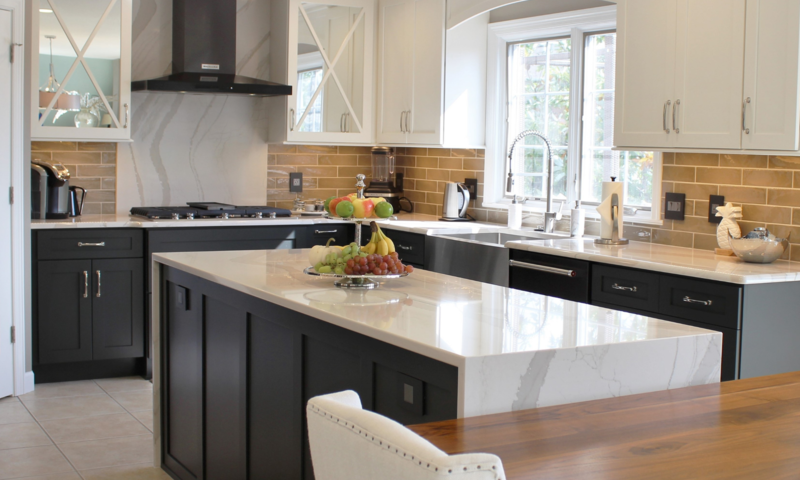 That is why we can’t reveal the full tour of this kitchen here on the blog. The best way to see it is to watch the episode shared above. See a full tour from start to finish and help us welcome two visitors from Dura Supreme to be some of the very first guests in the new space. Can you walk up to your trash bin and tap the lid open with just a nudge of your knee? These homeowners can. And just how custom can a unique bar top shape be? Want to save some of these ideas for your own project? Se the full album of photos over on our Houzz page here and save them to your own project ideabooks. 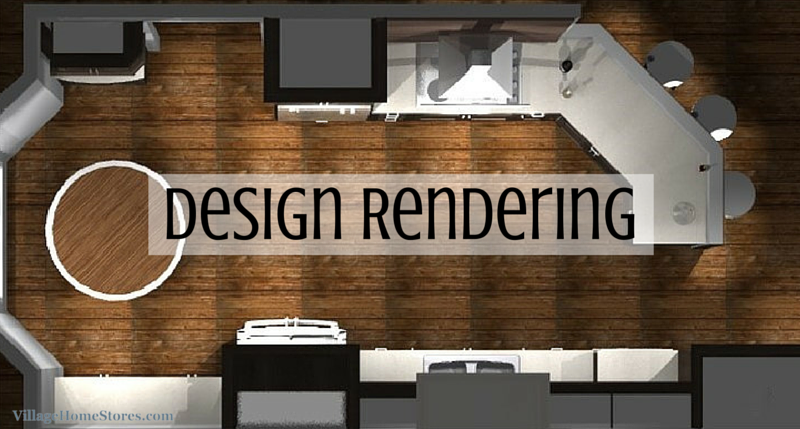 Do you want to make your dream kitchen a reality? are there walls in the way of that space? We can help! Call or click today to set up an appointment and start the conversation about your own before and after story. Previous PostPrevious East Moline Remodel: Hickory Steals The Show!